I live in Arlington and I drive to The Crafty Scrapper every chance I get. 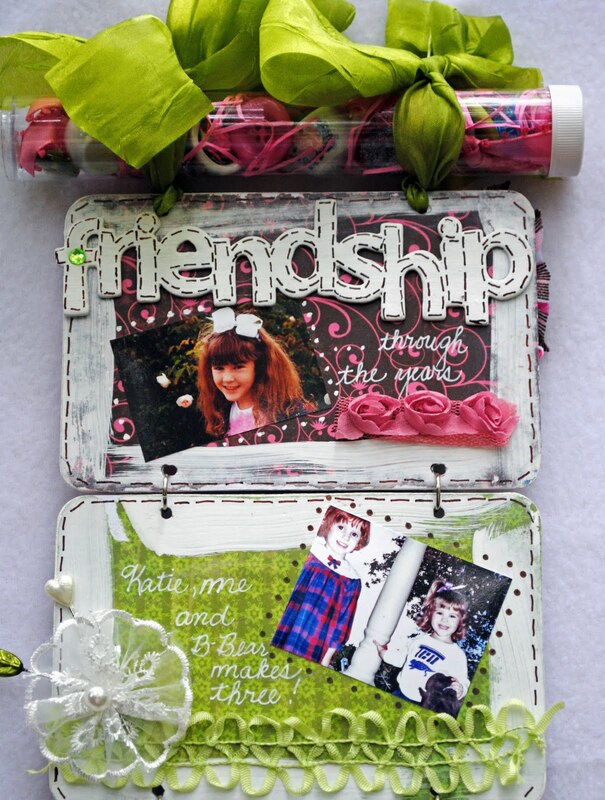 I have been an avid scrapbooker for 8 years. 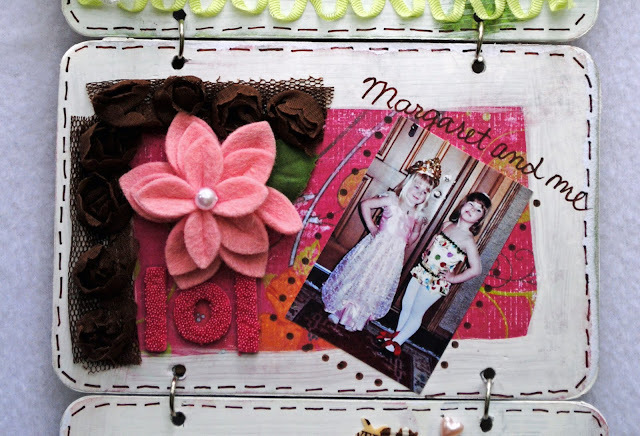 I studied art for over 10 years, and I have found that scrapbooking is such wonderful medium to work with. I have been married for almost 41 years and have 4 grown children. I have 3 grandchildren, and the 4th one due in late May 2011. They are my greatest source of inspiration. I love the cute little photos and bring them to life on my layout pages. My mother (79) and grandmother (98) are still alive, and doing very well. They give me the encouragement to do heritage layouts. My grandmother has known 8 generations and she is my greatest source of information. 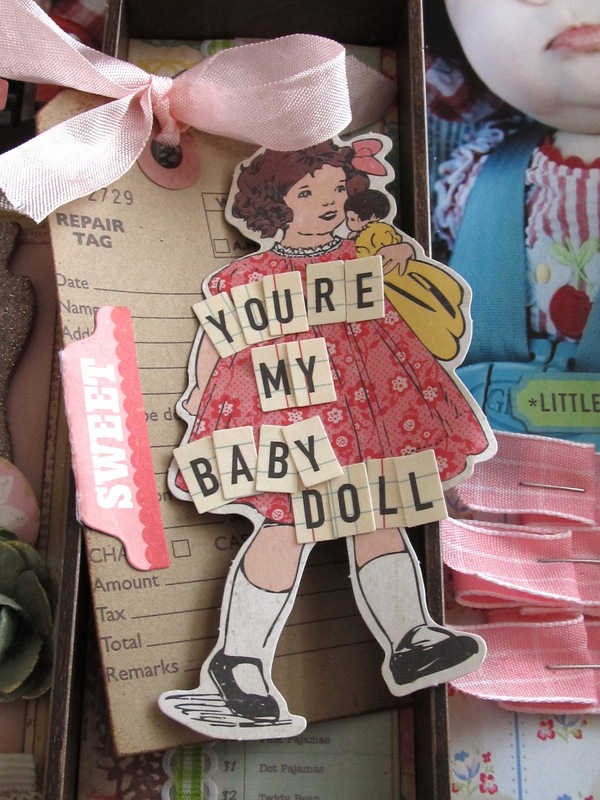 I find that my pages, techniques, and style comes from all the inspiration that I receive at The Crafty Scrapper. 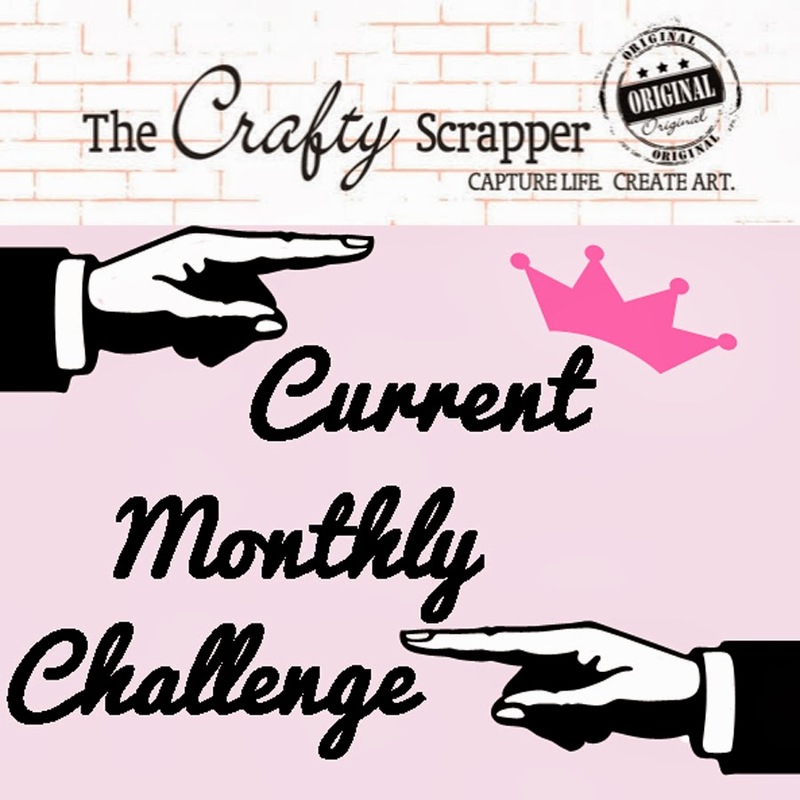 I am so thrilled and delighted to be a member of The Crafty Scrapper Design Team. This sweet mini was designed by Patty Rogers. The Maya Road chipboard albums are so precious, and the Accordion Album is no exception. 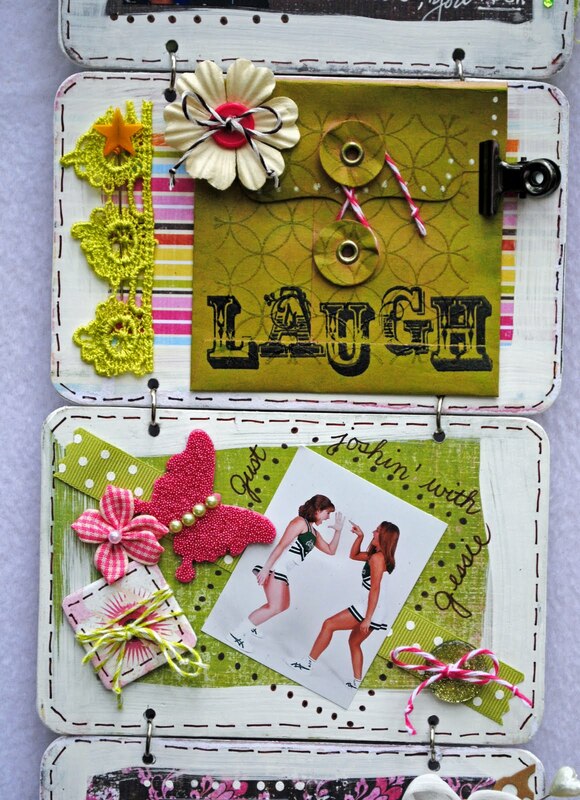 This Design Team project for The Crafty Scrapper in Waxahachie, Texas was delightfully fun to do. The theme, Friendship Through the Years, is based on some of the friendships of my daughter, Elizabeth, from her toddler and childhood days through her senior year in high school. 1. Remove all jump rings from book and save. 2. Trace the album page onto patterned paper. Cut out 12. 3. Using an acid free glue stick, adhere the paper to both sides of each album page. Press together firmly. Allow time for drying. 4. Using sanding tools, sand around all edges of each page. 5. Using white acrylic paint, apply paint to the edges of each page. Allow time for drying. 6. Sand off some of the paint to achieve a distressed look. 7. Using pen, draw stitches around edges of each page. 8. Using punching tool, punch holes. 9. Apply photos and embelish the book. Reassemble, using jump rings. 10. Fill the little plastic tube with goodies that work well with the album. Keep theme and colors in mind. Glue the lid on and tie it to the top of the album with ribbon. Voila! This is one of my favorite pictures of our son, Lee and daughter, Elizabeth. There were many days when they were little that I didn't think the teasing and fussing would ever end. I don't know when it happened, but I'm happy to report that somewhere along the way they became best of friends! On the back of the banner are pictures of Elizabeth's high school days and some of the friends she made at that time in her life. In this photo you can see some of the fun things that I put inside the little tube. They inclued four little china teacups shreds of paper, Maya road and Prima Fairytale Roses, tiny blue hairclips and pretty little pink bows.....so very girly, just like Liz!!! In the picture below, I first stamped the envelope using a Studio G cling mounted stamp, embossed it, then inked it with Ranger Adirondack (Lettuce). Last, I used StayzOn Ink (black) and "Laugh With Me Quotes" by Fiskars to stamp the word, "Laugh". In the upper left corner of the page above is a small pink butterfly. 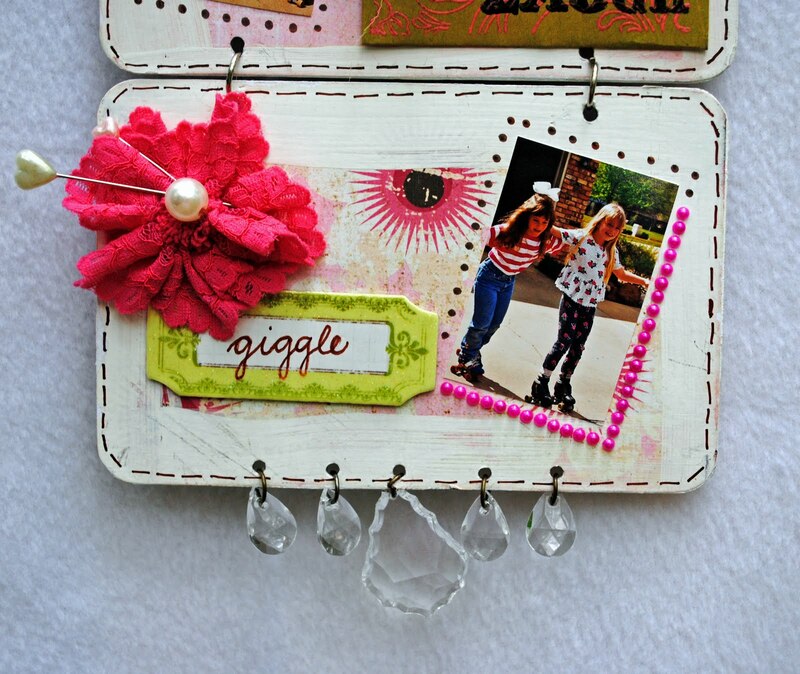 This little chipboard by Maya Road was fun and easy to do. First, I inked it bright pink, then coated it with Ranger's Glossy Accents and let it dry. Last, I added some little lime green pearls down the center for fun. 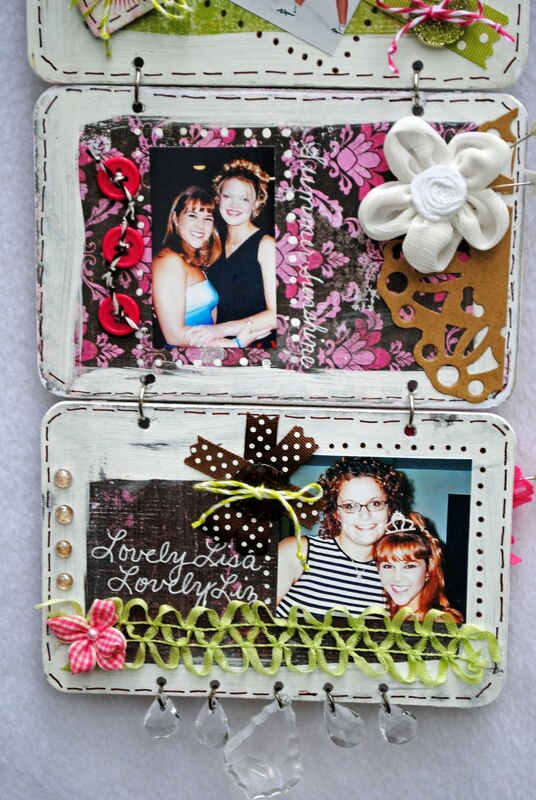 We showing off more of Melissa's work for The Crafty Scrapper today. Here are a few fun facts she shared about herself. 1. I LOVE to dance…all kinds of dance! I’m currently a Zumba fanatic and I just signed up for lessons in Lindy Hop, Two-Step, Triple-Two step, Jitterbug, Salsa, and Swing….every evening of the week. Call me crazy! 2. My husband has completely converted me into a geek-loving Sci-Fi lover. You would never know it…I’m still try coming to grips with it myself. 3. I love distress inks…you will probably see them, in some form or fashion, on everything I create. I love it so much, I’ve considered wearing it as part of my make-up routine. I really don’t personally need any more distressing though. DE-stressing, yes! So fun! :) Here are more detailed photos of that amazing sneak peek we shared yesterday. 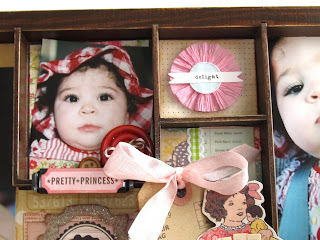 Be sure to check out the rest of the pages next time you're in The Crafty Scrapper! More new designs from our AMAZING design team coming soon. 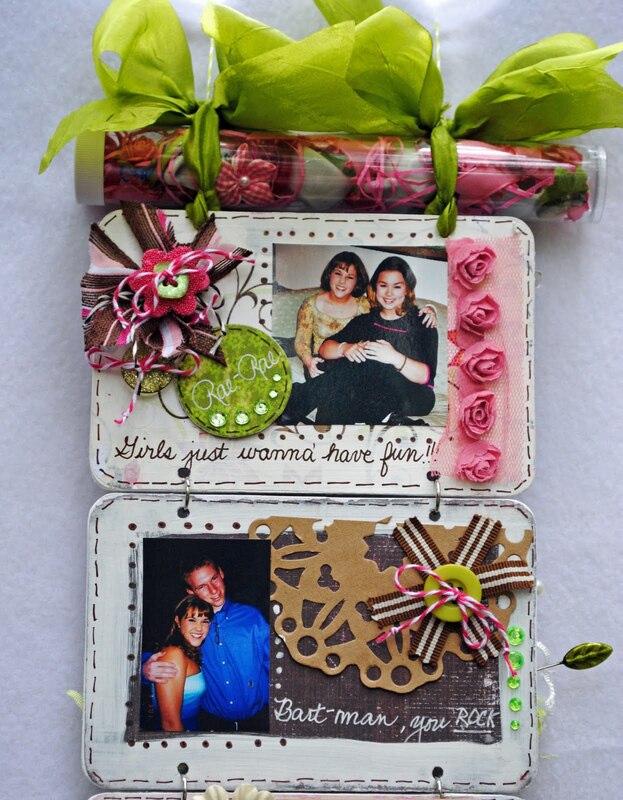 "My name is Melissa Sauls and I am soooo excited to be a part of the Crafty Scrapper Design team!!!! 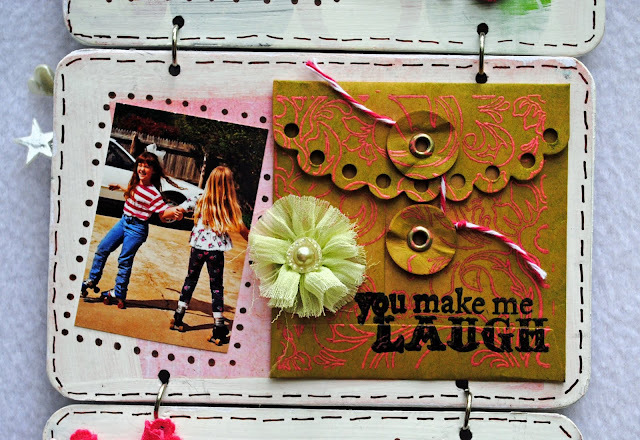 I am a die-hard stamper/card maker and started out like most…a stamping party! I was introduced to the craft about 7 years ago when a good friend of mine invited me to a “stamp party.” A stamp party…hmm…I wasn’t sure if I wanted to go. The whole time, I literally thought I was going to a party about postage stamps! Well, it turned out to NOT be about anything postage related and it was a pure hit with me! I’m an engineer by trade so you could probably call me anti-artistic but I loved every single second of what I created! My style has definitely evolved over the past few years and I’d say that I’m DEFINITELY into the vintage/shabby looks right now. Give me vintage trim, twills and ribbon, flowers, bling, and creamy colors and I’m just in heaven! When I’m not “making magic” in the wee hours of the morning, I tend to my adorable, yet rambunctious 3 and 7 year olds. After a very full day of that, I’m ready to wind down and give myself some well-needed crafting therapy. You must be with me on that, right??" 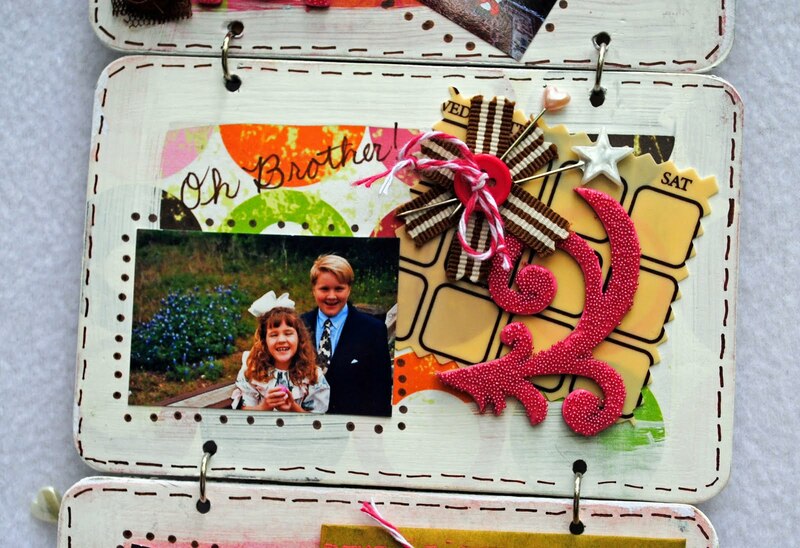 And here's a quick peek at a gorgeous Summery album Melissa put together for The Crafty Scrapper this week. Check back tomorrow for more detailed photos of this sweet album. I want to share one of my favorite projects I created for The Crafty Scrapper recently. I really love the bright Spring colors. It's Maya Road ATC holder with 6 boxes. This is my favorite box. I found this broken acrylic wing in my stash, and used it to represent the disease and healing process I have been going through. 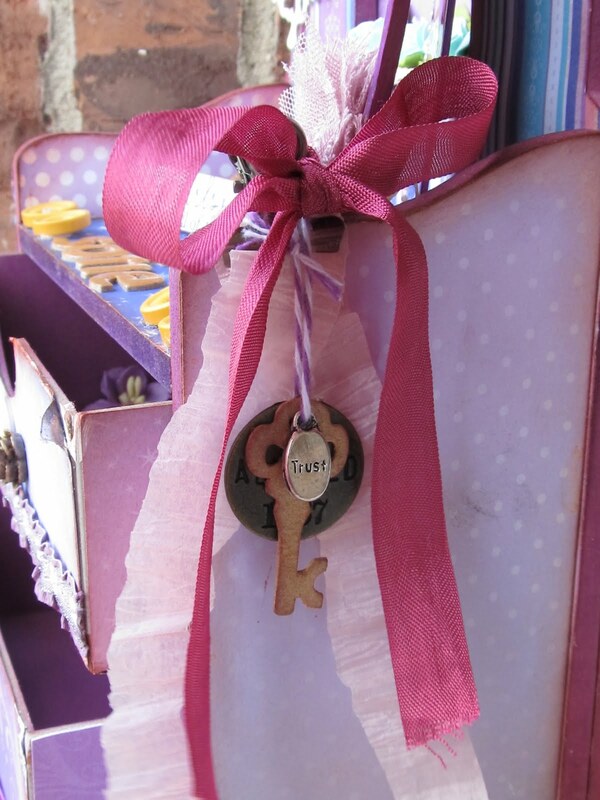 I created a little banner to layer over this box on the end, and used some collaged patterned paper in the box. I am really into purples and aqua right now. This slot took a lot of work: stamping, painting, stitching, misting, adding in punches, etc. Definitely worth the final look. I will be teaching this as a class on May 14th at The Crafty Scrapper. Hope to have you join me, or you can call the store and order a kit. Creativity Belongs to all of us! 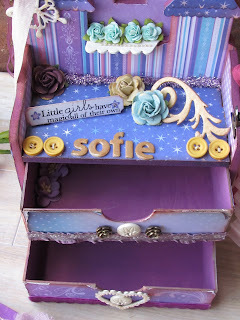 I recently designed this shabby fairytale jewelry box for The Crafty Scrapper using the new Magic Happens collection. This is the top shelf with a removable photo tag. The picture is of my daughter on her second birthday. I added lots of Prima roses, and a Maya Road butterfly, Maya Road scroll, Maya Road window ledge, and MME buttons, and lots of bling! The drawers to which I added Jenni Bowlin buttons and Maya Road resin flowers and a chipboard heart. Hand-dyed seam binding and crepe paper tie on these sweet metal charms. 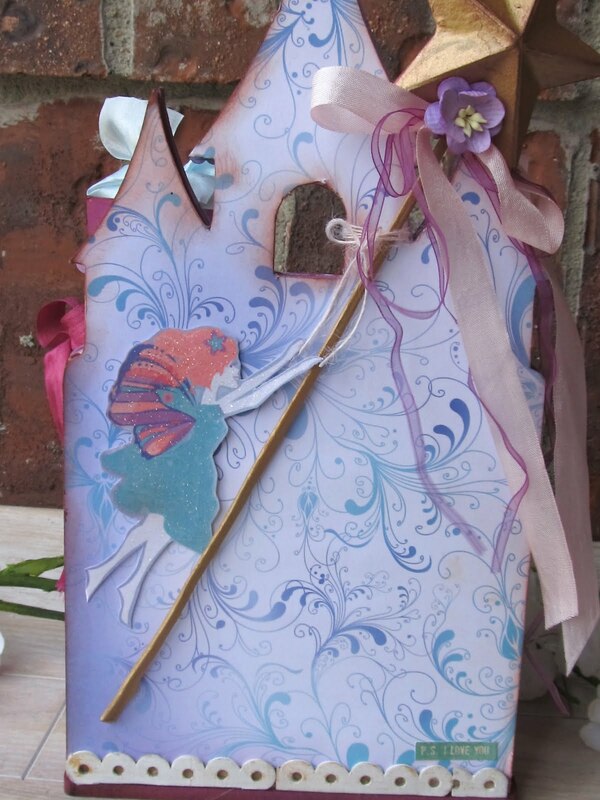 The hand-cut fairy is holding a removable wand that I painted gold and adorned with flowers, buttons, and ribbons. I painted the insides of the drawers a rich purple, and added a few flowers in as well. I just love the whole thing. :) I might teach it as a class in May. I have been wanting to put this shadowbox together since first seeing it at The Crafty Scrapper. I am going to hang it in my bedroom. 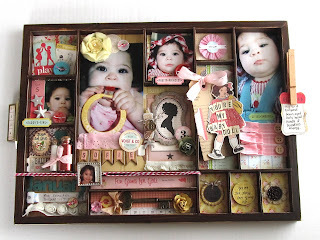 I used a sweet and soft yellow fabric flower by Prima over the large photo, and a full set of buttons from Crate Paper's new Emma's Shoppe collection throughout the shadowbox. The Crafty Scrapper now carries twine in a dozen colors so I used some to tie down this metal charm that I picked up from the store's vintage section. Then I added her photo, and outlined the photo with mini self-adhesive pearls. The silhouette card is by Jenni Bowlin, and I added trinkets from my stash. The "r" is for our last name, and is by Making Memories. The mini banner pieces are by Maya Road. I painted them gold, and outlined them with a fine-tipped black marker. Every night (since she was born) when I put her to bed I tell her "you're the tiny love of my life." The crocheted flower is by Kaiser Craft and the resin blossom is from Maya Road. 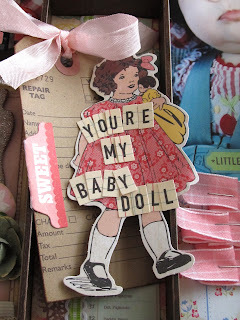 I love this paper-doll cut out from Crate Paper. So sweet. I love this photo of her. She was so cute in the red gingham outfit. I loved it because it came with that big floppy hat.